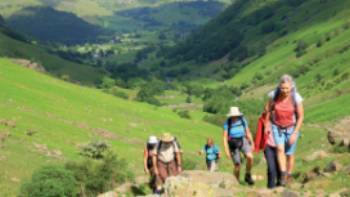 Devised by renowned walker and writer Alfred Wainwright in 1973, the Coast to Coast Walk is the most famous long-distance trail in UK. 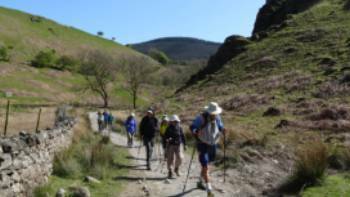 At 315km or 195 miles, the Coast to Coast Walk uses a network of public footpaths tracks, permissive paths and access land to cross England’s huge variety of landscapes, terrain, villages and three unique national parks – the Lake District, Yorkshire Dales and North York Moors. Walkers are encouraged to dip their boots in the Irish Sea the before setting off and in the North Sea at the end of the trail. 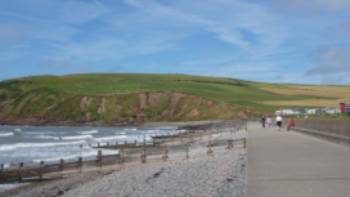 Starting in the tiny Cumbrian seaside village of St Bees, the trail climbs steeply into the Lake District National Park, home to spectacular lake and mountain scenery, before crossing classic rolling farmland, the Pennine Hills and the mystical cairns atop Nine Standards Rigg. Follow the beautiful River Swale to the historic market town of Richmond before leaving the Yorkshire Dales to cross the low-lying Vale of Mowbray and linking up with the North York Moors National Park. From here the trail undulates spectacularly before depositing you at Robin’s Hood Bay. 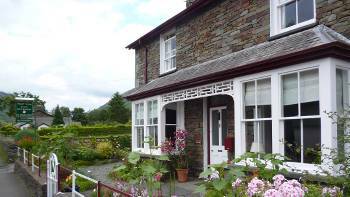 As you make your way across the Coast to Coast trail on foot or by bike, enjoy staying in specially handpicked hotels, guesthouses and pubs, where you’ll come to appreciate just how much a full English breakfast will set you up for a long day of walking or cycling. Because of the popularity of this trail, people often fall into the trap of thinking that it is easy. However, our trips on the Coast to Coast trail are amongst our most challenging but rewarding tours in Europe. 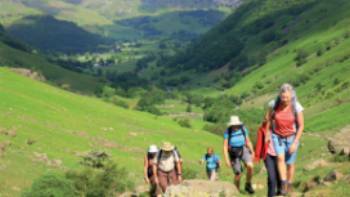 Experience the diversity of England by choosing a guided or self guided walking or cycling trip on the Coast to Coast trail. Our active trips on the Coast to Coast trail in England only include what you need like accommodation, meals, bikes on cycle trips, luggage transfers, maps and route directions on self guided trips and an experienced local guide for group trips, as well as the peace of mind that comes with complete backup and support. 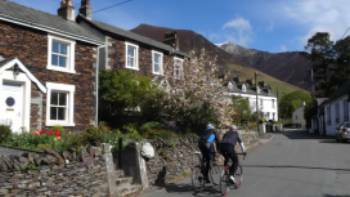 Cycling or walking, 2 star or 4 star, small groups or self guided, land or sea - we can help you the Coast to Coast trail exactly the way you want. 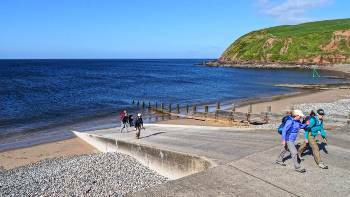 Dip your boots in the Irish Sea at St Bees and again at the end of your walk, in the North Sea at Robin Hood’s Bay. 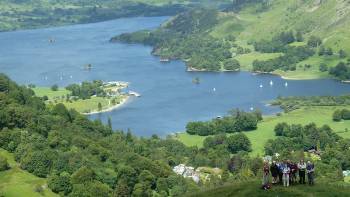 See some of the best mountain and lake scenery in the UK in the Lake District. Experience classic rolling farmland, the Pennine Hills and the mystical Nine Standards Rigg in the Yorkshire Dales. Visit the charismatic market town of Richmond, founded by the Normans. Cross the Cleveland Hills, also known as the ‘Cleveland Frontline’, in the North York Moors. Celebrate the end of your journey with a well-deserved pint or ice-cream in the charming seaside village of Robin Hood’s Bay. The climate of northern England is variable with rainfall occurring throughout the year (though more likely from October to April). The sunniest month is July. On average temperatures between April and October range from 4°C (39°F) -19°C (67°F), although it may be slightly cooler on higher sections. Being prepared with the correct clothing and equipment for the conditions is important as the going may be muddy underfoot in wet weather. Electricity in England is 230 Volts, at 50 hertz. The most common pin type is G (UK – 3 prong). Visas not required for citizens of Australia, Canada, USA and New Zealand for up to 90 days in a period of 180 days for all Schengen countries (see www. schengenvisainfo.com/schengen-visa-countries-list/ for countries part of the Schengen). Please ensure your passport is stamped on arrival in the Schengen area. For all other nationalities and for longer stays in countries covered by the Schengen Agreement (Australian New Zealand, Canadian and US passport holders), please contact the relevant embassy. Stays of longer than 90 days in the Schengen area require a long stay visa for the country you are spending most time in. However long stay visas are unlikely to be issued unless there is a valid reason (eg. studying in country). Unfortunately we cannot assist in obtaining visas for long stays due to individual country visa requirements. Your safety is our number one concern. Our safety track record is exemplary thanks to careful management and thorough consultation with local partners. Our industry leading risk management procedures have become a skill that we continue to refine. Our leaders in the field are highly trained and have safety as their number one priority. Expert leaders, risk assessments, quality inclusions and your financial security all come standard when you travel with us. Please refer to our Travel Advisory page for updates on recent events, travel warnings and advice. We strongly recommend that all clients take out travel insurance at the time of booking to cover against sickness, accident, loss of baggage, unexpected alterations to travel arrangements and travel disruption, emergency evacuation, cancellations, etc. Insurance information is enclosed with your pre-departure information. Please contact us if you would like to obtain a quote for your trip duration. We suggest that you consult your doctor, local government inoculation centre or a travel medical specialist in order to get the most current advice regarding vaccination requirements. Money and valuables should always be stored safely when travelling. Keep your passport with you at all times and do not leave it in your main luggage. You will need it to change money and check into hotels. Where safety deposit boxes are available, we recommend that you use them. Keep jewellery and valuables to a minimum.